The beauty and shine of copper cookware is undeniably attractive. Its unrivaled heat conductivity translates to shorter cooking times. So, restaurants often favour the use of copper utensils. It is also known for its natural anti-microbial properties. As one of the essential micro nutrients, trace amounts of copper has its health benefits. In spite of all these pros, everyday use of copper is uncommon. Why? In addition to being expensive, it takes effort to maintain their look and shine. Copper utensils cannot be used for cooking acidic foods as they leach, introducing unwanted toxins into the food. These days copper vessels are lined with less-reactive metals like silver, tin or stainless steel, utilizing its heat conductivity, but avoiding its toxicity. The mini-copper pot or kadai seen below is a recent addition to my kitchen. Though they require extra caring, I simply adore them. Lined with tin, these are oven-safe and broiler-safe. They are perfect for serving individual sized portions. What better Metal to Click than copper. What do you say? The days are already getting warmer in the American Southwest. Its hard to believe that spring has just sprung, because temperatures are already in the upper 80s. Melons and coconut water are sneaking into the refrigerator. An inexpensive way to beat the heat is spiced buttermilk, like the ones my mom used to make. 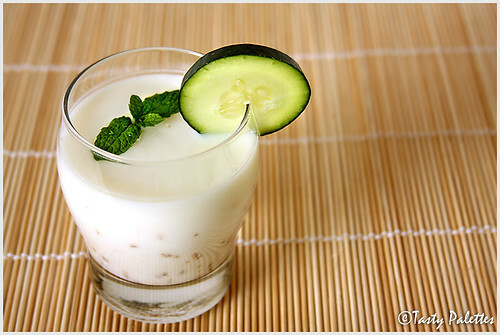 Diluted yogurt with a bit of salt, sugar and a sprig or two of herbs is a good electrolyte during summer in India. Summer in the desert is no less brutal. Hence, I make spiced buttermilk quite often, each time a little different. This time I prepared it with crushed cumin and ginger. If this sounds familiar, you may have seen it at Food For Thought, by Ashwini. Even a humble drink like this looks glamorous in her blog, thanks to her knack with the camera. Her gorgeous photos have always been an inspiration to me. This is my entry to Sig’s MBP – Drinks, an event started by Coffee. I became aware of veganism not long ago. Ever since, I try to cook everyday dishes the vegan way, as much as I can. But making a dessert the vegan way is a bit tricky, if they are not fruit based. Pies, trifles, cheesecakes, are anything but vegan. Or so I thought until now. 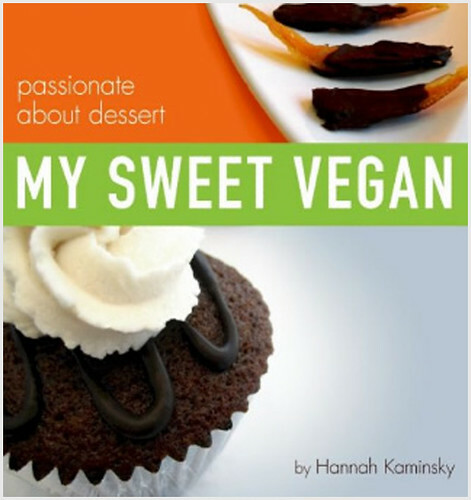 Hannah Kaminsky, has done an excellent job of delighting us with her vegan dessert collection, through her book - My Sweet Vegan. To be honest, before leafing through the book, I was expecting just a humble set of recipes. But I was pleasantly surprised to see the ‘real deal’. Classic recipes like Crumb Topped Brownies, Autumn Harvest Pie; kids favorites like Peanut Butter Bombs, Oreo cookies and Crème Pound Cake; modern creations like Green Tea Tiramisu, Wasabi Chocolate Cupcakes; you name it, Hannah has it. 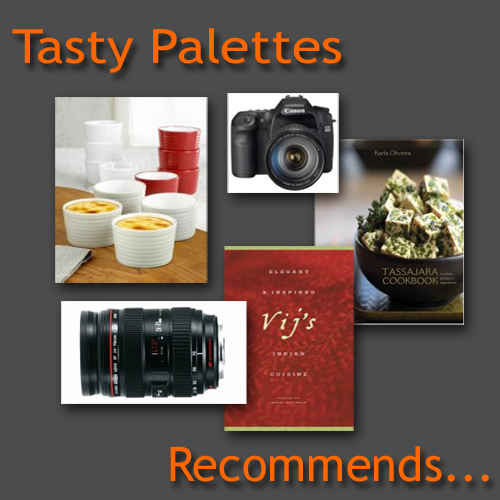 A modern twist to the original recipes is what I like the most about this book. 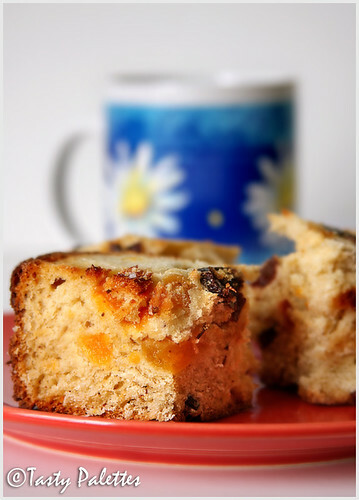 Each recipe is accompanied by a lovely picture, taken by Hannah herself. So you don’t have to guess whether the dish looks the way its supposed to be. To see whether the recipes are as good as they look like, I attempted to try a few. I was drawn to this recipe as soon as I opened the book. Savory focaccia is all I have known so far. This sweet twist proved to be delicious. We gorged half as it is, while the other half (Hannah, you may want to close your ears) was baked into bread pudding. It was one of best puddings I ever had. The slightly sweet, fruit studded bread was perfect. Combining island flavours of the drink Pina Colada, these delicate mini cakes were a hit. The coconut, once baked, was aromatic, making the cake light on texture, but strong on flavor. It tasted just fine even without the sugar glaze that Hannah has suggested. I enjoyed it with evening tea. What a dessert book is, without chocolate. It was difficult to choose just one among many. I chose this recipe to test, as it had my favorite combination – chocolate and almond. 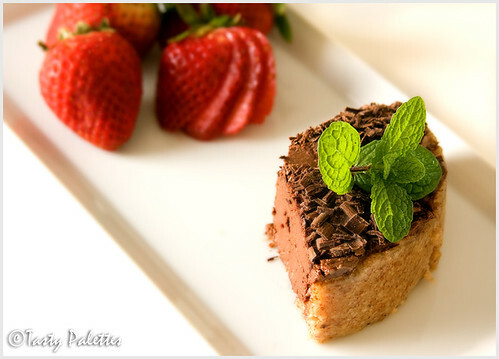 The crust is made with ground almonds, while the mousse is made with silken tofu and chocolate. The cake was out of this world. I made extra mousse and served in small bowls, topped with mixed berries. I am so looking forward to making this cake over and over again. Now, this is not all. There are other mouth-watering array of recipes, categorized into Sweet Starts, Cookies and Bars, Cakes and Cupcakes, Pies and Tarts, and Miscellaneous Morsels and Desserts. The book also has a food-allergy index, so there is no reason not to enjoy this book. Thank you Hannah and Alisa, for sending me a copy to review. I thoroughly enjoyed the recipes I tried so far. Hannah, I cannot appreciate enough what you have achieved at such a young age. Kudos! Making granola at home, like Meeta says, is not only fun, but unbelievably easy. You can perfectly tailor it to suit your palette. And, best of all, its quite healthy. No funny sounding ingredients in here. Taking this to the next level, I make granola into bars. They are handy, equally tasty and doesn’t require cold milk to go along, on a chilly morning. A perfect companion for your morning cuppa’ joe. When it comes to bars, Alton Brown’s recipe is my favorite. Its simple, satisfying, flavorsome and flexible. I have made these many times substituting original ingredients with what I had on hand; and it has turned great every single time. Preheat oven to 350F. Grease a 9x9 glass baking dish. 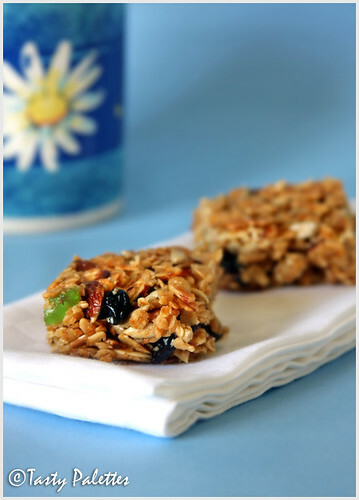 Mix oats, sun flower seeds, almonds, wheat germ on a baking sheet and bake for 8 minutes, mixing once in between. Meanwhile, in a pan, heat butter, brown sugar, vanilla and honey together. After the sugar has dissolved, let the mixture bubble up for a minute. Add oat mixture to jaggery and mix it all together. Transfer the mixture to the greased glass dish and press down evenly with the back of a spatula. Bake for 25 minutes. When cooled, cut into 16 squares. This is my second entry to Mansi’s WBB – Balanced Breakfasts, an event started by Nandita of Saffron Trail. Some days I am just not in the mood for cold salads. But I make it a point to include raw greens at least once a week. I do it by combining cold greens with something warm or hot. These combo platters are great lunch ideas and I usually serve with a tall glass of homemade fruit smoothie. While cooking couscous, I always flavour it by adding cumin powder, as they go really well together. To make this simple meal fancy, I have added Peppadews. When bit, these peppers start sweet, but end with a light kick at the back of the mouth. I love these peppers, because they are juicy, tasty and best of all, colourful. They look like rose petals in the plate, adding to the visual appeal. I usually find them in olive bars in the supermarkets. Next time you spot these peppers, do try; you are in for a surprise. 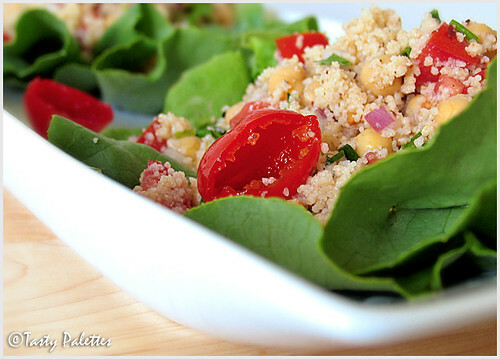 Roasted red pepper may be substituted for peppadews, but the salad will taste slightly smoky. Boil 1½ cups of water. Add cumin powder and stir until dissolved. Now add couscous, cover and set aside for 10 minutes. When done, fluff with a fork. Wash lettuce and pat them dry. In a big bowl, whisk together, lemon juice, red pepper flakes, olive oil and salt. To this, add onion, tomato, peppadew peppers, chickpeas and cilantro. 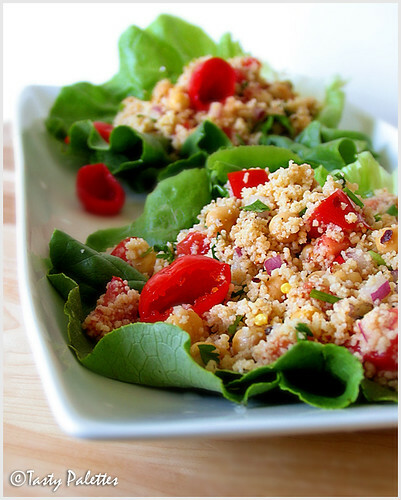 Fold everything together along with couscous. Check for seasoning and spoon onto lettuce leaves. Satisfactorily serves 2. I asked What Could That Be? And, most of you answered it correctly. Its purple kale. For those who are not familiar with kale, it belongs to the same family as the green kale. The difference is, green kale grows as stalks, while the purple variety grow as heads, hence the name ‘flowering kale’. 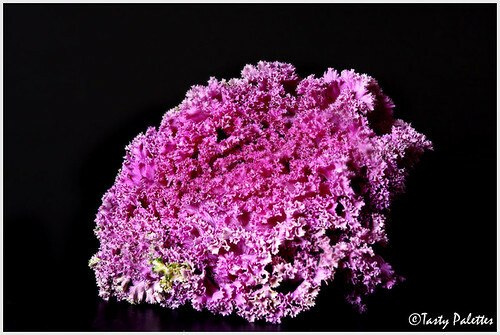 Some species of purple kale are also used as for ornamental purposes, but may not be edible. While I was editing the photo, it looked more like a coral than a green. Guess it was just me, because so many of you guessed it right. But now, if I squint my eyes, it looks like Tina Turner’s wig, Bee ;). Purple kale is not regularly available in our neighborhood stores. When I found it in the local market, I jumped with joy. As usual, I had no idea what this would taste like. But the colour purple was too enticing. But I was in for a surprise, whilst I cooked it. Green kale is very tough, chewy and doesn’t have a signature aroma. If not cooked properly, it tastes more like an old shoe. On the other hand, purple kale was very aromatic and tender. Even while I was sautéing, I started munching from the pan, which I normally don’t do with green kale until it is thoroughly cooked. I decided to pair this aromatic green with equally fragrant Basmati rice. 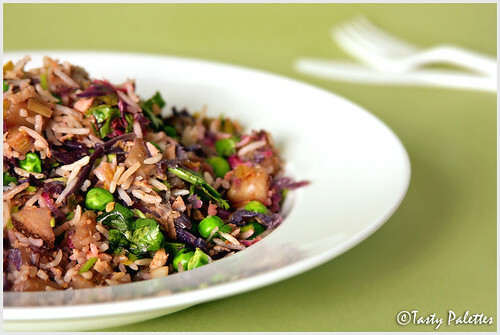 The purple from the kale stained the rice, giving the pulao a mellow mauve color. I kept the spices to a minimum, letting kale take all the attention. I sautéed the whole head, used half in pulao and made enchiladas with the other. In both the dishes, I was thoroughly impressed with purple kale. If you get a chance to lay hand on this beauty, don’t miss. Cook basmati rice with 1 to 1¼ cup of water. Fluff and cool till the grains are separate. Heat a tbsp of oil and sauté kale till its soft. Remove and set aside. In the same pan, heat another tbsp of oil and add spices for tempering given in the above said order. 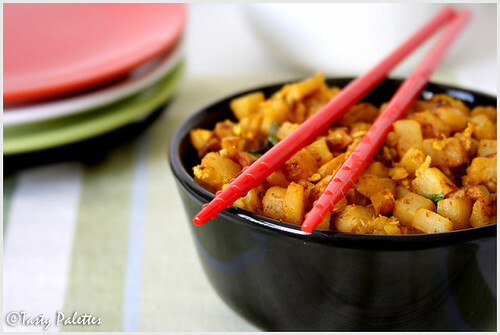 When the spices get slightly toasty, add onion, garlic, ginger, green chillies and potato. Sauté until onions and potatoes are soft. Now add the kale back, along with red pepper flakes, green peas, coconut and salt. Mix well and add rice. Gently mix the pulao and heat through. Check for seasoning and garnish with cilantro. 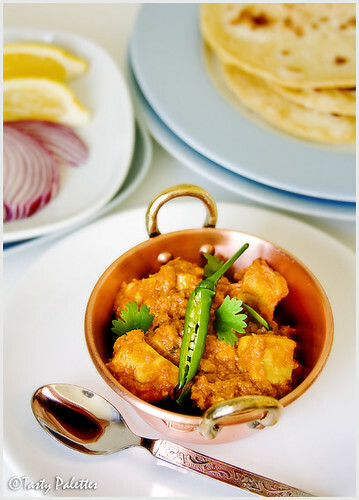 Serve with raita of your choice. 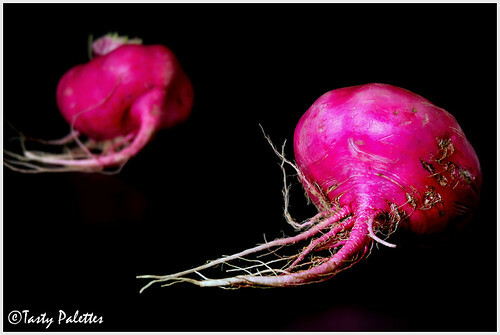 Talking about the colour purple, I also came across these beauties in our local market - Purple Turnips. The woman next to me said ‘They look like giant radishes’. I smiled to myself. Well, they do belong to the same family. Turnips, known as ‘Nool Kol’ in Tamil and ‘Shalgam’ in Hindi, is well-known for its bitterness. I would say its texture is like that of a firm, but bitter white pumpkin. To overcome its bitterness, I boil it once in water, drain and boil again. But it still retains its bitterness to a certain extent. So, now-a-days, I cook turnip in tamarind water, drain and use it in any recipe. This way, it never tastes bitter. This is how I served these purple beauties. I boiled the peeled, cubed turnip pieces in tamarind water; drained and sautéed them with salt and sambar powder; finished with a tbsp of grated coconut. We loved it. I know any purple lover, including me, cannot help, but fall for both these purple beauties. Nature has a unique of expressing herself. We first tasted sweet potato fries in a café. This café serves healthy sandwich and rolls, many of them under 300 calories, with a side of 4 grain rice or baked french fries – potato or sweet potato. Adventurous foodies we are, we ordered sweet potato fries. And there started our addiction to sweet potato fries. After our lunch, I walked straight across to a super market and bought some, to enjoy fries at home. They are mildly sweet and crunchy, most importantly, guilt free. I second Nupur that sweet potato should be given its long due attention. With an impressive nutritional profile, there are more reasons now to consume these dainty tubers than ever. 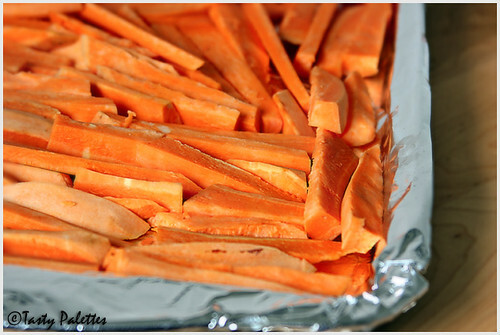 Baked fries are our most preferred choice of eating sweet potatoes. Not a big fan of gravies or dry curries. 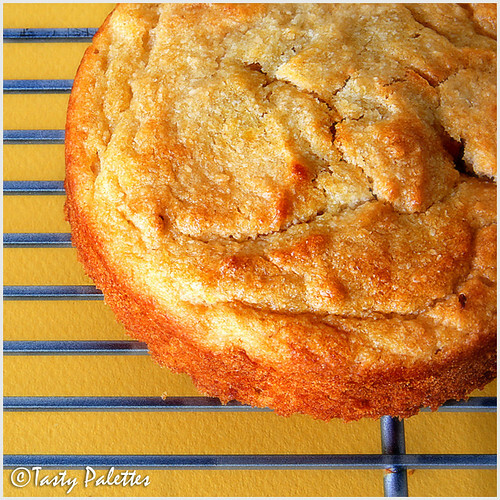 I have been experimenting with the baking temperature to arrive at the following recipe. But, keep in mind, the baking time depends on the type of tuber and how thin/thick your fries are. 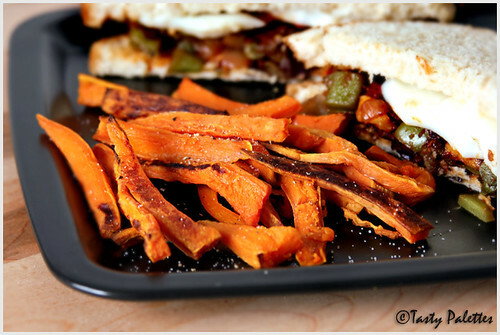 Simple as 1,2,3, you are bound to be hooked with baked sweet potato fries. Sia, this is my Ode to Potato. Preheat oven to 425F. Line a baking sheet with foil. 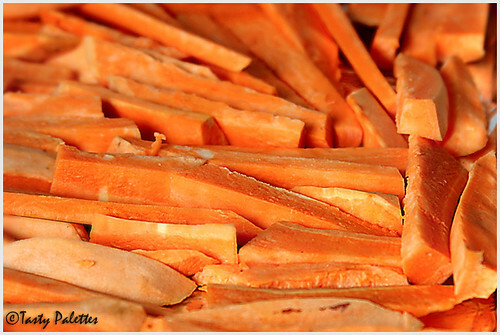 Toss sweet potato pieces in oil. You can also transfer fries to the baking sheet and then spray oil, instead of tossing ‘em. It is important to arrange the fries in a single layer for even cooking. Bake for 20 minutes. Lower the oven temperature to 400F. Turn the fries over gently using a spatula without mashing them. Bake for additional 20 minutes, until the fries are toasty and slightly crispy. Take ‘em out of the oven and immediately season with salt and pepper. You can also season the fries with garlic powder or any other seasoning mix of your choice. Let the fries rest for 5 minutes before serving. Serves 2 as a side. Send me healthy breakfast ideas, I said. Send you did, 76 of ‘em. I enjoyed hosting this event, because every morning bloggers flooded my inbox with brilliant breakfast ideas. 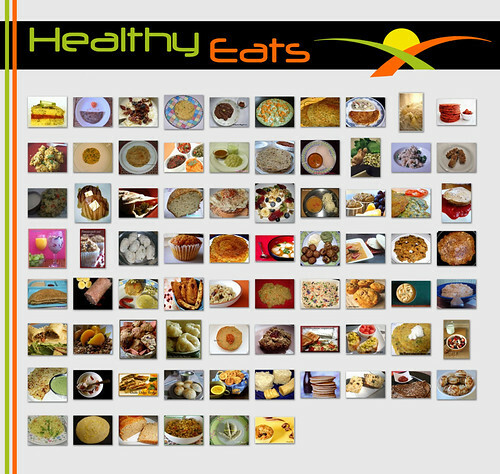 Flat breads, wraps, whole grain breakfast bowls, quick breads, you name it, I received it. So if you are looking for ideas for a nutritious breakfast, this roundup is what you may be looking for. I thank each and every one of you for participating in this event and making it a grand success. I also thank Nandita at Saffron Trail for entrusting me with her famed event. Without further ado, I present you with a lovely array of healthy breakfast recipes. The collage below will also take you to the gallery. The entries are in the order in which I received ‘em. Please write to me if there are any errors or omissions. The event logo in the left pane will bring you to this page for future reference. For next edition of WBB, visit Fun and Food. Mansi is calling for Balanced Breakfast recipes.